Compensation for foundation staff and, when applicable, board members must be reasonable, according to IRS regulations. “Reasonable” is defined as the amount that would ordinarily be paid for like services by like organizations in like circumstances. There’s an art and a science to finding the sweet spot for compensation for your foundation. I can help you find that sweet spot and, importantly, help you document your decision in case questions arise in the future. 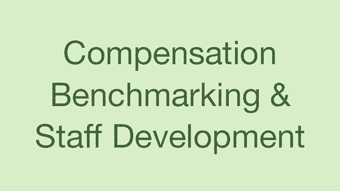 I’ve worked with scores of foundations, assisting them in determining what reasonable compensation levels are for their board members and for their staff. Call me to discuss how I approach compensation analysis, and whether you’d like me to prepare a compensation analysis for your foundation. I can provide support during the hiring process or assist with improving organizational culture through a process similar to 360 reviews with recommendations, especially regarding upgrading and updating performance reviews. I can also benchmark your foundation against sector norms and draft or review employee manuals. My priorities in these projects are internal consistency, culture-strengthening strategies, and relying on sound data. *My area of legal expertise is corporate and tax nonprofit law, not employment law; you will also need attorney input or review or participation in ensuring the legal compliance of your employee manual. I know several excellent employment law attorneys and can make recommendations based on your particulars.